Quick, complete leather care in one bottle. New formula cleans better and also absorbs into the leather faster. The scent has also been revised to provide more of a natural leather fragrance. While the two-step, cleansing and conditioning method is still the preferred method of caring for fine leather, new technology yields similar results in half the time. If you could get comparable results from a quick, one-step product, why wouldn�t you? Now you can with Pinnacle Leather Cleaner & Conditioner. Every day, your leather seats are subject to heat, friction, UV exposure, dirt, and body oil. Regular cleaning and conditioning is essential to maintain the look, feel, and smell of fine leather upholstery. Without it, leather becomes stained, dry, and cracked � not inviting at all. Clean and replenish your leather with the rich, proprietary formula found in Pinnacle Leather Cleaner & Conditioner. Remarkably, this formula removes dirt and body oil while infusing the leather with oils that are essential to maintain the luxurious texture of leather. Gentle cleaners penetrate the pores of the leather to lift out stains and dirt while the moisturizers sink into the leather, restoring and hydrating from the inside out. This intense moisture infusion leaves your leather upholstery feeling soft and supple, like new leather. 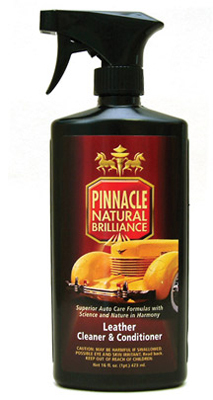 Pinnacle Leather Cleaner & Conditioner is water-based and non-alkaline. Unlike saddle-soap (an alkaline soap), Pinnacle�s thick lotion has a neutral pH. Alkaline cleaners will rob the leather of essential moisture, which speeds up the process of decay. Pinnacle Leather Cleaner & Conditioner infuses moisture while lifting and suspending dirt and stains. Contamination will migrate to the surface of the leather as the natural fibers fill with essential oils. Added UV inhibitors provide the leather with a strong defense against moisture-depleting UV radiation. For more protection, equip your vehicle with a sun shade. The finish created by Pinnacle Leather Cleaner & Conditioner is completely natural. It recreates the look of supple, healthy leather. The surface of the leather will feel clean, dry, and soft � never greasy. It will even smell like new leather! Leather seats should receive the complete two-step process at least twice a year with Pinnacle Leather & Vinyl Cleaner and Pinnacle Leather Conditioner, more frequently with everyday drivers. For weekly maintenance of high traffic areas, use Pinnacle Leather Cleaner & Conditioner. Treat your leather interior to the finest one step cleaner/conditioner on the market! Pinnacle Leather Cleaner & Conditioner cleans, restores, and replenishes leather for long-lasting softness. Test an inconspicuous spot for color-fastness. This is recommended with any leather product. Mist the seat and massage the cleaner into the leather with a microfiber applicator pad. Buff away excess with a clean microfiber towel, such as the Cobra Microfiber Detailing Cloth. Pinnacle Leather Cleaner & Conditioner absorbs and dries quickly. The driver's seat will dry in a matter of minutes. Cleans, conditions, smells and works great! I got it on a BOGO price-matched from AG. 32 oz for $7, but Vega from Autopia was very cool and gave me a 64 oz bottle instead for $7. Yes, a 64 oz PINNACLE product that cleans and conditions leather!! ConsPrice? I got a super cheap and unbelievable deal though. Well worth it! !